The Back of the Book (from Amazon): In their most popular book, bestselling authors Eric and Leslie Ludy challenge singles to take a fresh approach to relationships in a culture where love has been replaced by cheap sensual passion. 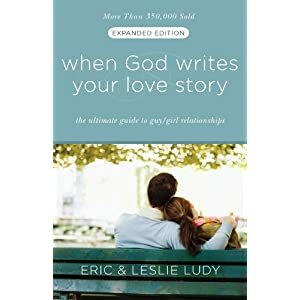 When God Writes Your Love Story: The Ultimate Approach to Guy/Girl Relationships shows that God’s way to true love brings fulfillment and romance in its purest, richest, and most satisfying form. This new edition includes an extra chapter from Leslie Ludy about the surprises of life after marriage! “I had dreamed of a perfect love story for my entire life. But somewhere in the midst of the endless cycle of temporary romances, my dreams had shattered.” How can I find a love worth waiting for? Lay the foundation now—whether you’ve met your future spouse or not—for a lifelong romance. Bestselling authors Eric and Leslie Ludy invite you to discover how beautiful your love story can be when the Author of romance scripts every detail. NotJustLaura’s Review: When I was interested in romantic relationships I spent hours preparing myself in front of the mirror. My hair and make-up had to be perfect. I had to pick out clothes to show myself to advantage. There must be no chips in my nails and I had to drench myself in perfume. In this book, Eric and Leslie Ludy offer suggestions for a different kind of preparation – one I wish I had known about when I was 17. With anecdotes from their own romance and examples from the lives of young people they’ve counselled, the Ludys put forward a pattern for a God-centred preparation for romance. As with all their books, this one is beautifully written although I did find some of the language to be aimed at a younger reader than me – ‘cool’ and ‘dude’ haven’t been part of my vocabulary for a while now! Reread: Finished 2nd February 2012. Authors and Publishers: I accept books for review. Read my Review Policy and comment if you'd like to get in touch. ... if you click through from my site to Amazon and make a purchase I may receive a small commission. Money raised in this way will be used to buy books!